Comprehensive lists like this are a little daunting for me to compose because the moment I hit the "publish" button there will be another kitchen, another home that I adore and found too late to add to this list. So if I'm real honest, I've been collecting these over the course of a couple months, hoping to track down some of my most adored kitchen spaces. Almost 4 years ago we renovated our own kitchen and since then, as you might imagine, my tastes have changed. 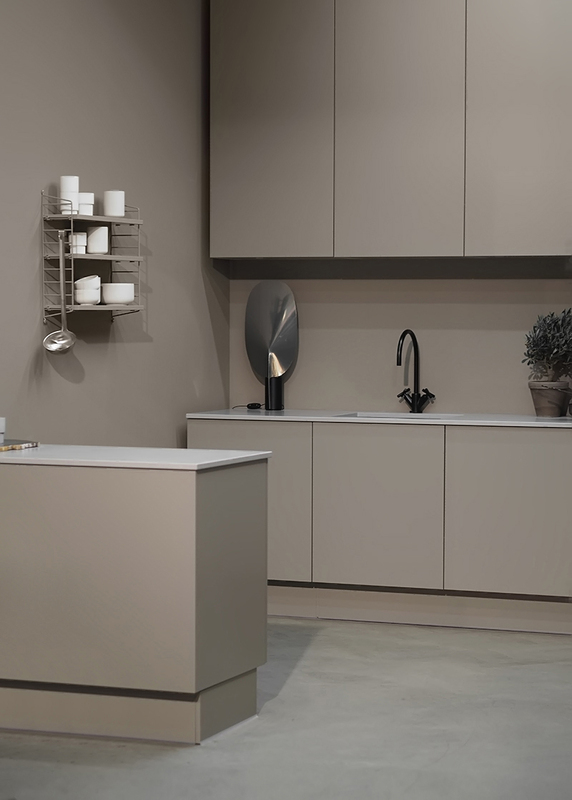 Our mostly white kitchen is still bright and cheery and super clean looking (when it's actually clean) but now I'm drawn much more to muted colors, greys and warm taupes with an all over color. New materials or new places for food preparation never cease to inspire like open fire cooking or even a Brown Jordan outdoor kitchen. Or kitchens with lime was backsplashes or dark wood cabinets doors. While my tastes have changed some, these kitchens stand out as some of my most favorite and I've gathered what I could find to share with you! 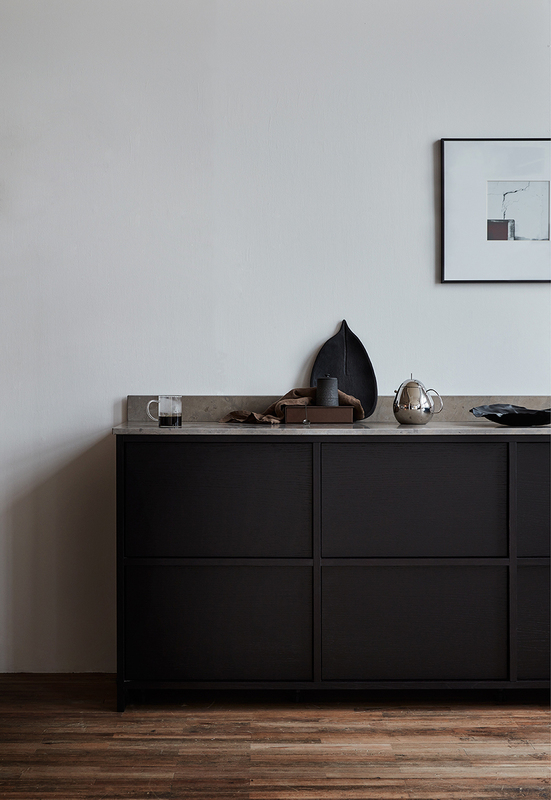 Practically a singular color, this matte moleskin painted concept kitchen created by Lotta Again for last year's Stockholm Furniture and Light Fair, photographed by the talented Katerina from ODL. 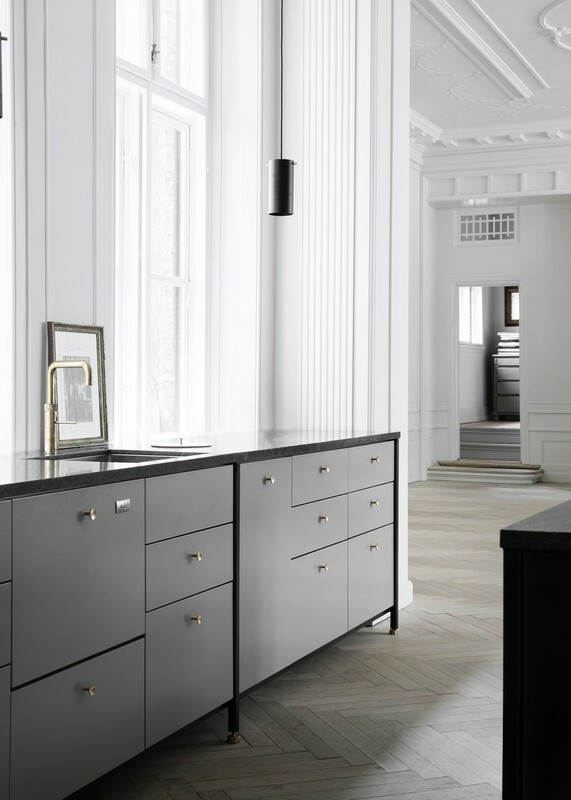 I've really embraced using out-of-the-ordinary materials in a kitchen but even I'm surprised by how nice this MDF kitchen from Plaza Interior looks. 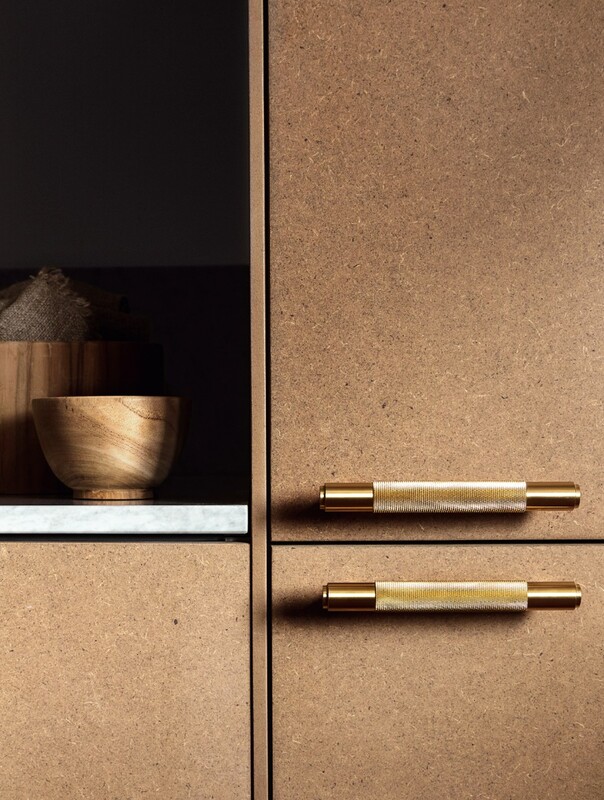 Painted with a clear matte finish, the color is like that of craft paper or cardboard but it looks ever so nice with brass handles and marble counters. 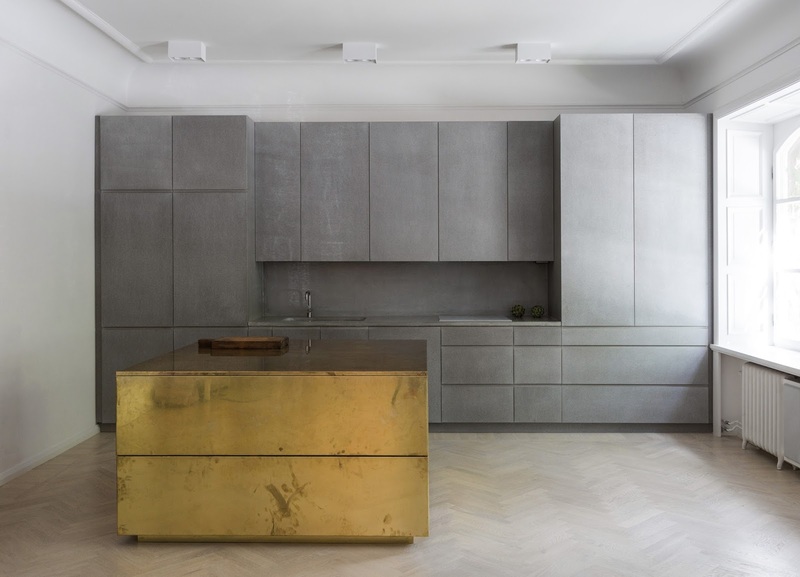 Robert Lindvall's kitchen design includes a brass plated island. I'm unsure of how this sort of material wears with food and water but I'm sure it patinas into a very rich a organic color. This against the valchromat cabinets is quite striking. 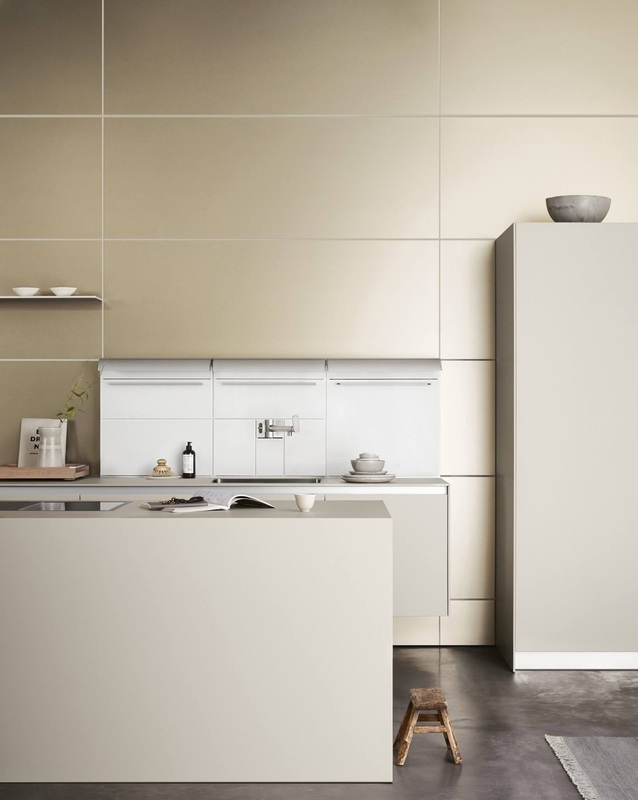 A large kitchen with ample storage, ladder included, and a central kitchen island for easy access to counter space from Kobenhavns Mobelsnedkeri. 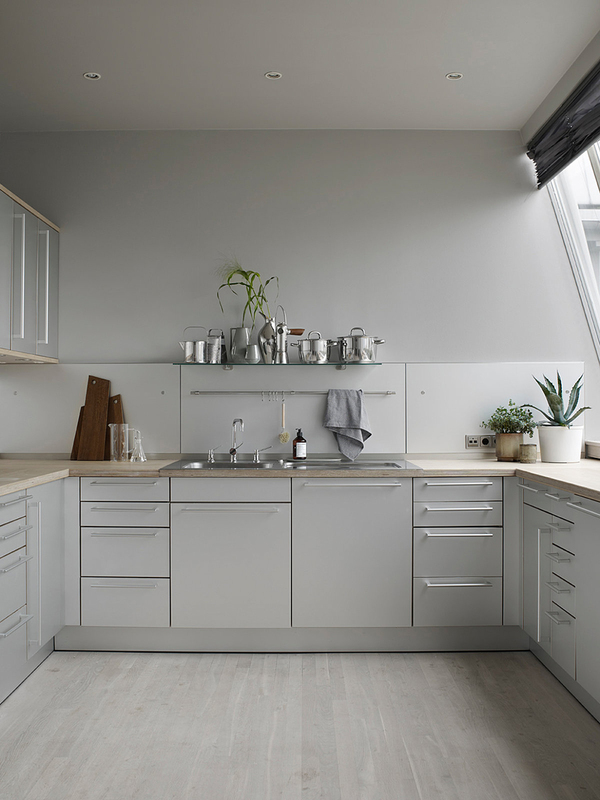 Cheery and bright this from Bulthaup kitchen proves you don't need white to have plenty of light in the kitchen. 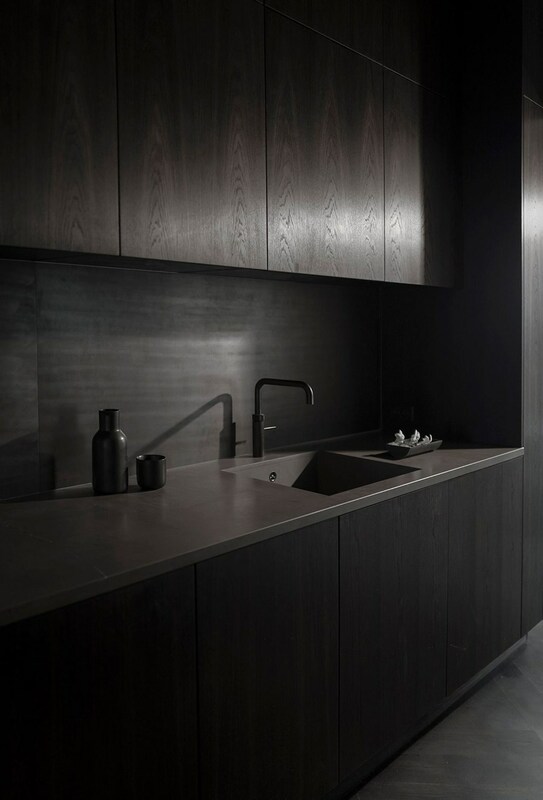 Norm Architects designed this dark on dark kitchen for The Silo with dark wooden cabinets, countertops, backsplash and even tap. This kitchen lacks upper cabinets and the bottoms have legs, resembling a piece of furniture rather than kitchen cabinets. Photographed by Fanny Hansson for Nordiska Kök. A home I shared last summer feels distinct by it's styling with chrome accents, hardware and pale wood counters. 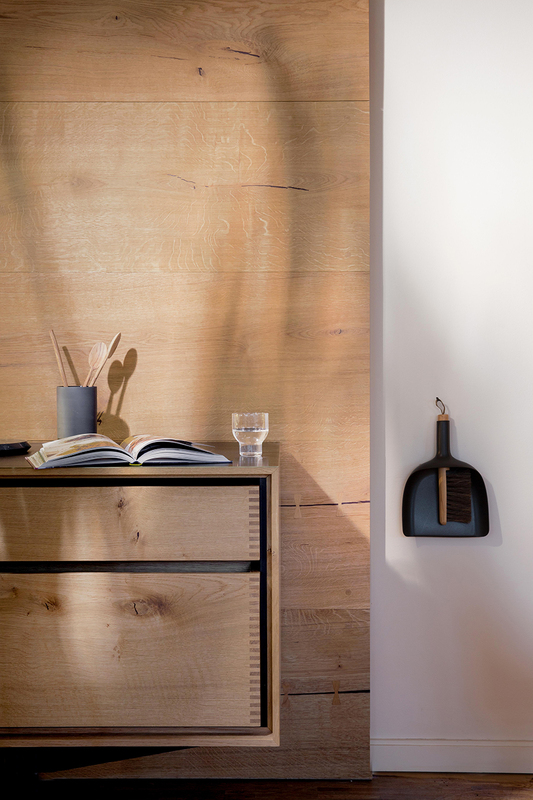 A kitchen by Garde Hvalsøe, who also happened to make the personal kitchen of renowned chef Rene Redzepi. The all wood look is beautiful and simple.